Craving this one today! Reposting this hearty original butternut squash recipe. Enjoy! Squash are reigning supreme at my local market, and one of my very favorites is the smooooth, sweet, easy on the taste-buds butternut squash. I found a big, blocky hulk of a butternut squash at my market, and decided it deserved to be treated right. Butternut squash flesh is firm, velvety, and subtly sweet. 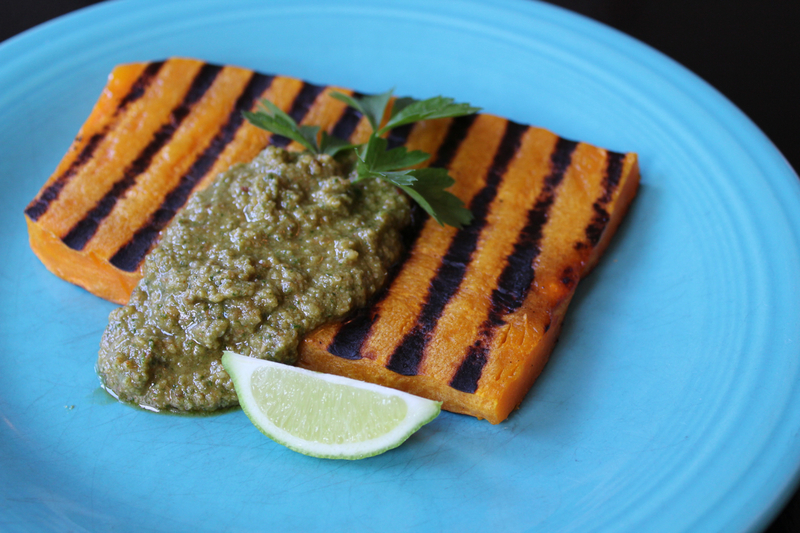 I paired the grilled squash steak with a rich, spicy, flavor-blasted pesto made from pepitas, chipotle, and tequila. Enjoy! For the pesto: Combine all ingredients except the squash in a food processor and process until a paste forms. Taste and adjust seasoning — adding more salt, lime juice or chipotle powder if desired. For the squash: Cut off the stem and peel the squash. 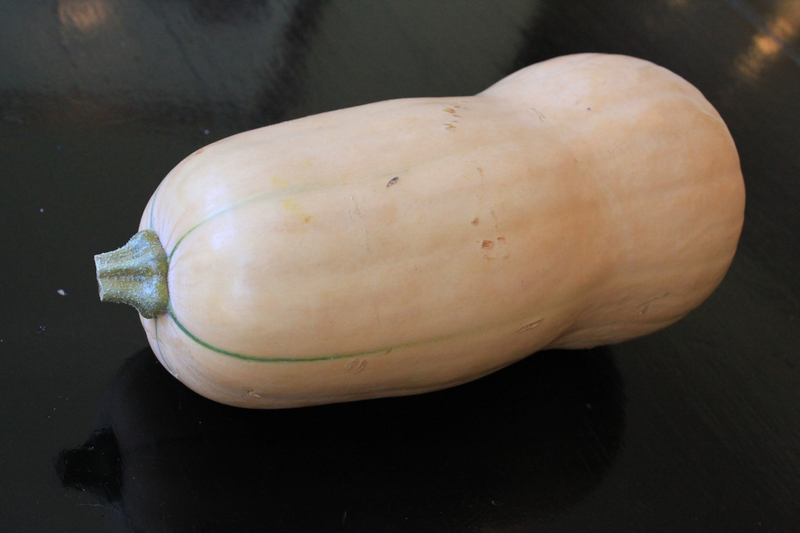 Butternut squash has smooth, pale skin. 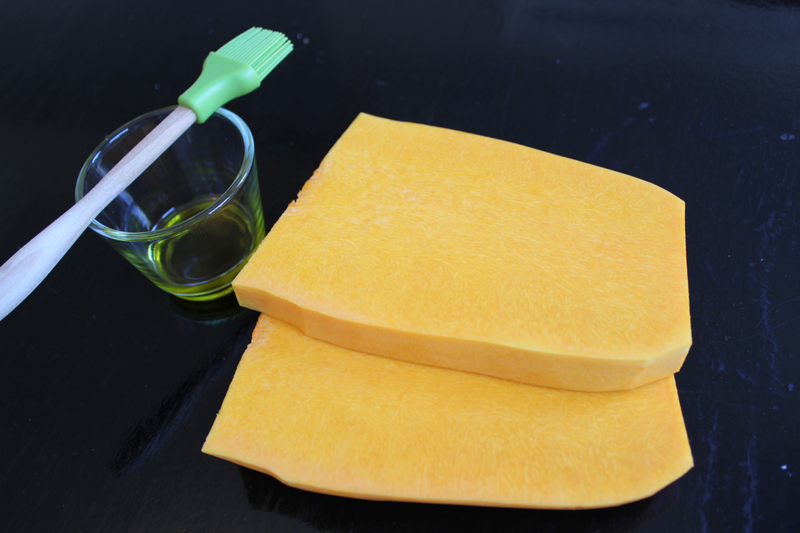 Using a vegetable peeler, make sure you get down to the vivid orange flesh of the squash. You will likely have to do two swipes with the peeler in the same area to reveal the vivid orange flesh. Then split the squash vertically, and scoop out the seeds in the round hollow portion of the squash. Next, cut the squash into thick steaks, about 1/2 inch thick. If your squash is really huge, you can cut the steaks into smaller planks. The goal is to have each steak be a single serving. Cut the rounded portion of the squash into smaller pieces to grill, or reserve for another recipe. Lightly brush the steaks with remaining 2 TB olive oil and season with salt and pepper.Heat your grill or large frying pan until hot. Lay the steaks on the grill and allow to cook for about 10 minutes. Then flip the steaks over, and cook until they are tender when pierced with the tip of a knife. Serve the hot squash steak with a generous dollop of Spicy Pepitas Pesto. If you made your pesto ahead of time, gently bring it to room temperature before serving. Make Ahead notes: This is a great dish for a fast dinner on a week night. Make the pesto a couple days in advance and store in the fridge. Prep the squash up to three days in advance, wrapping the peeled and sliced squash tightly and storing the in the fridge. Then all you have to do is brush the squash with oil, grill, and serve with pesto. For a complete meal pair with a fresh green salad and fresh seasonal fruit. I love this what a fantastic way to cook squash! And tequila in the pesto what a fantastic mexican twist!